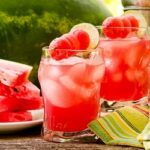 Watermelon Blast Cocktail is a refreshing summer drink with only 3 ingredients. Make it smooth style for easy sipping or chunky for added fun of chewing. Place watermelon chunks and lime juice in a blender. Blend until smooth. Pour through a fine mesh sieve into a bowl. Use a silicone spatula or spoon to press and move pulp around in the sieve to get as much liquid as possible. Discard pulp. You should get about 4 cups liquid. Place 1 1/2 cups watermelon-lime juice into a cocktail shaker. Add vodka. Shake and pour into ice filled glasses. Garnish with lime slices and watermelon balls if desired. Reserve remaining watermelon-lime juice for other purposes. Serve it over ice for a refreshing non-alcoholic beverage. You can also freeze it into cubes to use in the cocktail instead of regular ice. It's important to have all the ingredients for this version chilled because it is not served with ice (unless you use watermelon ice cubes - see above). Place 2 lime wedges and watermelon cubes in a cocktail shaker. Use a mortar to smash watermelon and lime. Do not smash watermelon completely so there will be small chunks of it in the cocktail. Add watermelon vodka. Shake and pour into glasses.